The eye spy quilts that I've seen have generally been made up of squares and each square has the 'eye spy' fabrics full of interesting things for children to find. There may be other eye spys out there, but I haven't come across them yet. 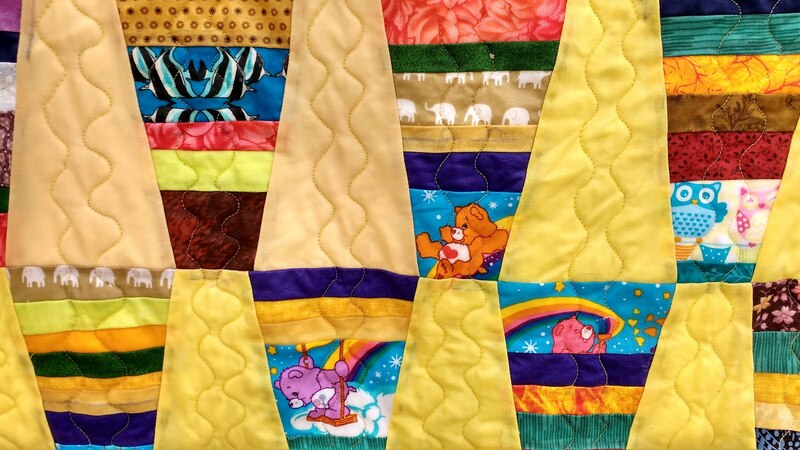 When I decided to put together some scraps of some children's type fabrics: care bears, elephants, fish and the like, I thought the tumbler shape might be fun. So I gathered the bits and pieces together and then thought it might be good for the eye to have a place to rest as well as to spy. So I included some yellow/light tan tumblers as well. In the past when I have made tumbler quilts, I've often just outlined the tumbler shape with a straight stitch - usually looks fine but a bit boring for this one I thought. So I did a simple double wiggle line down the centre of the blocks. Simple, but does the task of quilting which is mainly to hold the three layers of the quilt together and then to enhance the quilt overall. Its not fancy, nor is it intended to be, but I think it works Ok for this quilt. Not sure where this one will find a home as yet, but its nice to have a fun bright quilt on hand ready to give away as needed. 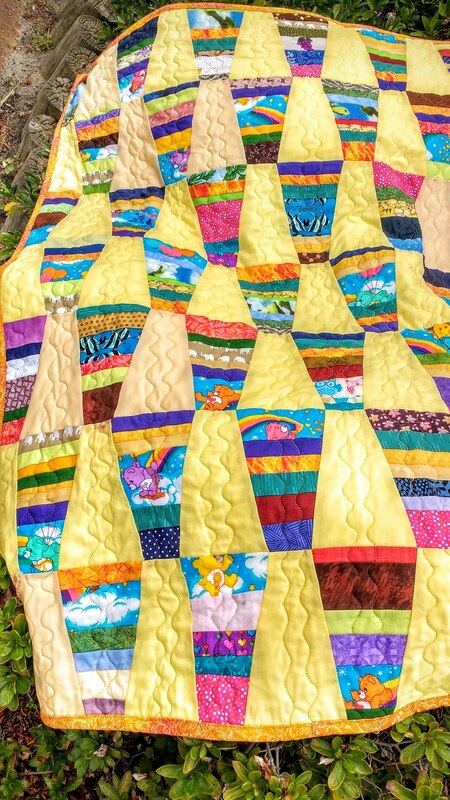 Oh that is a fun quilt! And what a great way to use up some fun scraps! Thanks Alicia, always looking to use up scraps. Thanks Beth, fun to do as well. It looks great Lynn! 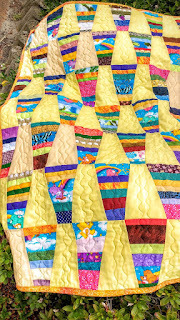 I love that sunny happy yellow and what a unique and terrific way to use scraps!